For some people, driving a Ferrari or a Lamborghini makes the bucket list, somewhere along the way, but here in Key West, things are a little less ostentatious. And besides, this tiny island city doesn’t require muscle to get around it, this is where people come to escape the rat race. 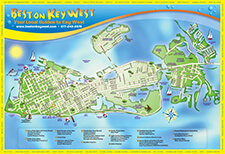 With that in mind, a Key West electric car rental is exactly what the doctor ordered. The best part about renting an electric car in Key West is that they are open air, which means you get to enjoy the warmth of the Gulf breeze everywhere you go. These unique electric cars come with various seating arrangements from a two seater all the way up to six seats, making it easy for you to transport your favorite people. The rentals are available in four-hour, half day, or full day rentals. 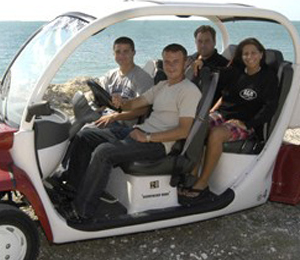 So if you’ve been wondering how to get around the island, skip the conventional car rental, and go with something fun, easy, and environmentally friendly. 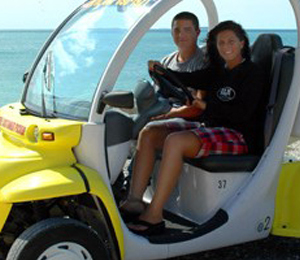 Navigating Key West’s historic streets is a cinch, and with no windows to block your view, sightseeing around the city in a key west electric car rental will be a memory to cherish. 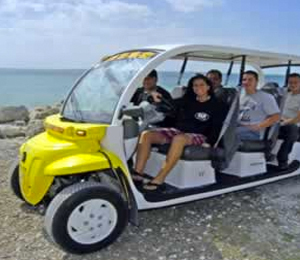 Make your way through the tropical island paradise of Key West in our open air electric cars. You and you entire party will be amazed at the ease and smoothness of a trip on these cars!